One thing I have noticed having used Windows 10 on various tablets, is that in many cases the auto rotation feature doesn’t always work correctly – both out of the box and after upgrading from Windows 8. I was confused, as my system’s Device Manager reported that the built in accelerometer was working fine – but despite this I still had no rotation. I believe the issue might be relating to the fact that, bizarrely, when you first activate Windows 10 (after a clean install or an upgrade), it is set to lock the auto rotate function by default. This meant, maybe coincidentally for me, that when I connected my tablet to a keyboard dock, it shows the screen as portrait when it should be landscape. It seems like a bit of a design flaw to me, but it’s easy to fix. With your touchscreen, swipe in from the right hand side of the screen to bring up the Action Centre. Then, check the option called ‘Rotation lock’ – if it’s on (i.e. its highlighted with a colour), tap it to turn it off. The icon should switch to a grey colour. Then try rotating your tablet. It should work correctly now. When you dock your keyboard (if you have one), it should also stay in the correct rotation. Drop a comment below letting us know whether this worked for you if you were having a similar issue. This entry was posted in Quick fixes and tips and tagged 10, accelerometer, auto, no, not, rotate, rotation, screen, tablet, windows, working on September 6, 2015 by GEEK!. WordPress is brilliant, undoubtedly, but there are some things that really drive me insane. Ever since WordPress 2.8.1 was released, I haven’t been able to use the automatic upgrade feature in WordPress because it simply does not work. This problem has been identified by many other WordPress users, but I know that not everyone has the problem. It is as simple as that. No error messages, no PHP warnings, just “Installation Failed”. I’ve been searching everywhere for a fix but I can’t find one anywhere. It’s beginning to really annoy me now. 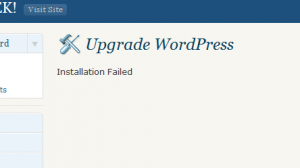 I’ve just ignored it for a while and upgraded WordPress manually – but it really drives me mad having to take down GEEK! and then put it back up. Has anyone found a fix for this problem? Update 13.9.09: A big thanks to “lujcas”, who has posted a comment with a fix to this problem. I’ve tested it and it seemed to work for me. To make it easier for everyone, I’ve uploaded the file he added to the GEEK! download server, so you can download a copy here. You just need to unzip the file and place it in the wp-includes directory on your WordPress install and overwrite any previous file. This entry was posted in Quick fixes and tips, Rants, Software and tagged 2.8.2, auto, fail, upgrade, wordpress on August 6, 2009 by GEEK!.